Thailand’s latest military coup was probably unavoidable. But that doesn’t make it any more likely that an army takeover will heal the country’s deep-seated divisions. The increased risk of violent conflict leaves the economy, which contracted by 2.1 per cent in the first quarter, further adrift. General Prayuth Chan-ocha seized control on May 22, saying the military had to restore order and push through reforms. Thailand’s twelfth successful coup in 82 years came after the military failed to mediate a compromise between anti-government protestors and the cabinet of ousted Prime Minister Yingluck Shinawatra. The army’s intervention ends a six-month political stalemate. But just like in the previous 2006 coup, the promised “reform” might just be a ruse for Thailand’s elite to deny political control to farmers in the country’s northeast. This group – already smarting from the manner in which the judiciary disposed of Yingluck – is in no mood to accept the overthrow of a democratically elected regime that has given them a very generous price for their rice. That makes the odds of a violent conflict higher now than eight years ago, when the military removed the government of Yingluck’s brother Thaksin Shinawatra. The political turmoil surrounding the last coup meant that Thailand missed the accelerating GDP growth that the rest of Asia enjoyed in 2007. Business sentiment, which had turned cautious as the Thaksin regime came under increasing fire in 2005, soured further under military rule. The junta-backed regime reversed Thaksin’s pro-market policies in the name of purging cronyism. Job vacancies fell for 32 straight months. After rising 20 percent in 2006, the number of international tourists visiting Thailand stalled for the next three years. This time, the impact could be more damaging. Whipping up economic nationalism could backfire at a time when the global economy is in far worse shape than in 2006. The coup may have been unavoidable. But if, instead of a true reconciliation, the promised political reforms become an attempt by the Bangkok-based elite to purge the Thaksin clan and dominate Thailand’s fiscally underfunded but more populous northeast, then cracks in the society will grow into schisms. The consequences for the economy would be awful. 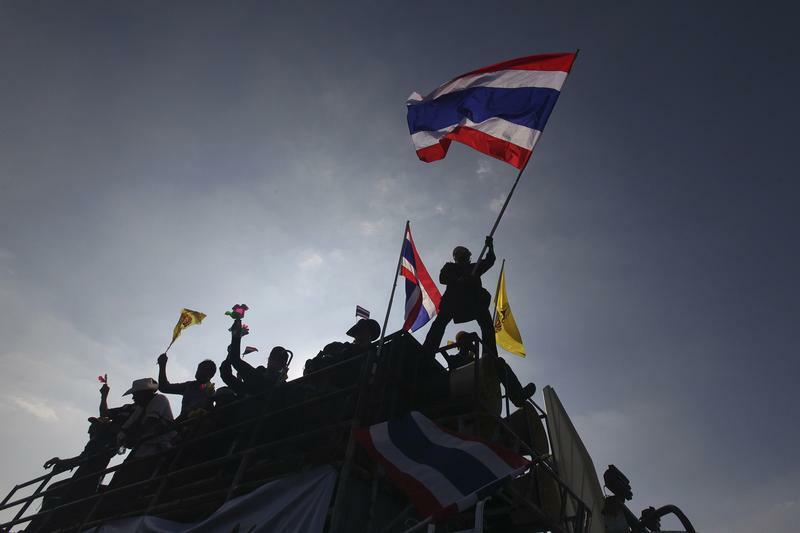 A protester waves a Thai national flag atop a truck at the Democracy Monument in central Bangkok November 4, 2013. Thailand’s army chief General Prayuth Chan-ocha seized control of the government on May 22, saying the military had to restore order and push through reforms. The country’s 12th successful coup since Thailand became a constitutional monarchy in 1932 came two days after General Prayuth failed to mediate a compromise between anti-government protestors and the cabinet of ousted Prime Minister Yingluck Shinawatra. The cabinet members refused to resign, a key demand of protest leader Suthep Thaugsuban, whose supporters have held demonstrations in Bangkok since early November. Thailand’s gross domestic product shrank 2.1 percent in the first quarter of 2014 from the previous three months, largely because of the political unrest. Thailand has had a caretaker government with limited borrowing and spending authority since Yingluck Shinawatra dissolved parliament in December.